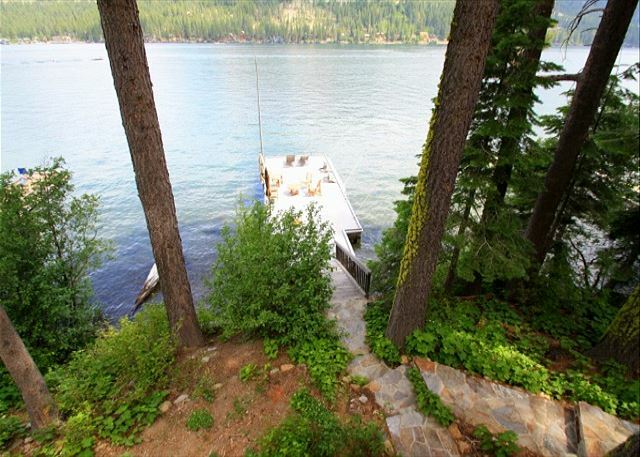 Truckee, CA United States - Christensen D. 078 (SUN) | Donner Lake Realty, Inc. Located on South Shore DR. Renters DO NOT have access to the unit under the garage. 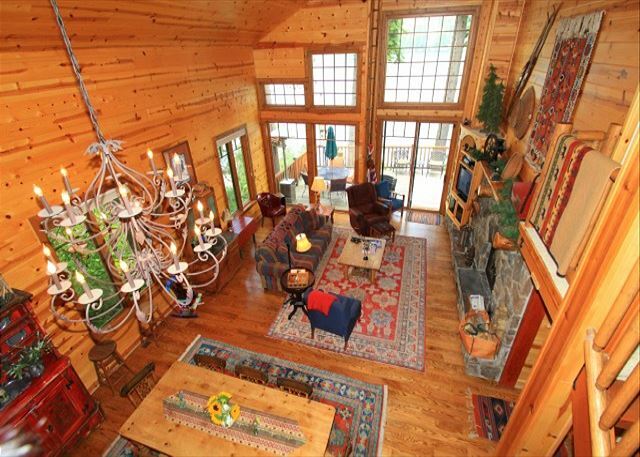 The Christensen house is 3 bedrooms + loft, 3.5 baths, a game room, sleeps 8. 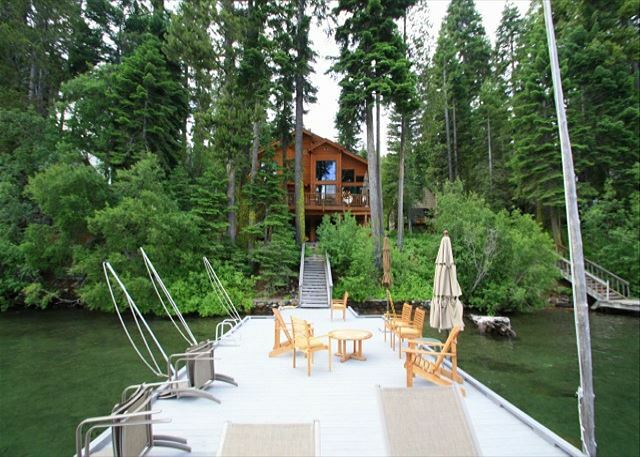 This unit is located on the south side of Donner Lake with your own private pier. You can park 2 cars in front of the garage, and in the summer one car down in front of the house. From the parking area at the house there are 5 steps to the main level. There you enter into the mud room you will find a office on the right with a private fireplace, and the living room on the left. 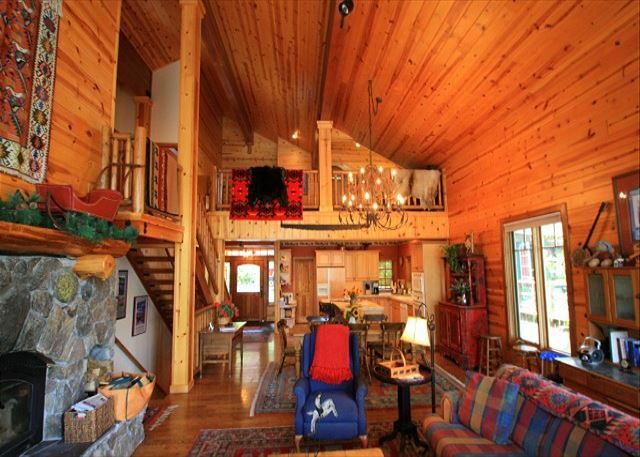 Next to the stairs is a .5 bath for use for the main living area. The living room, kitchen, and dining area with a high open beam ceiling, hardwood floors, and fireplace make one big great room. In the living room is sliding glass doors that lead out to the over-sized back deck which leads down to the private dock. From the deck it is part path and steps (36) down to the lake. 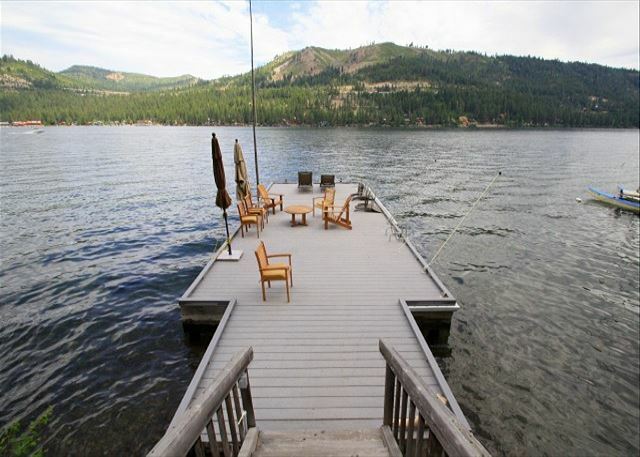 This dock is perfect for fishing or mooring a boat. Also on the main level is the master bedroom with private fireplace, King size bed, and private full bathroom with an additional Jacuzzi tub. From the living room is a set of stairs leading down to the fully furnished game room with ping pong table and flat screen TV. Upstairs from the living room are 2 bedrooms, 2 baths and the loft. 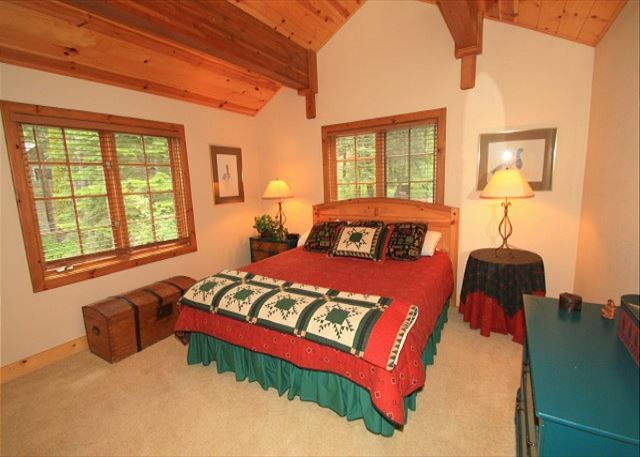 The first room has a King size bed, access to the back deck via a private staircase, and private bathroom. 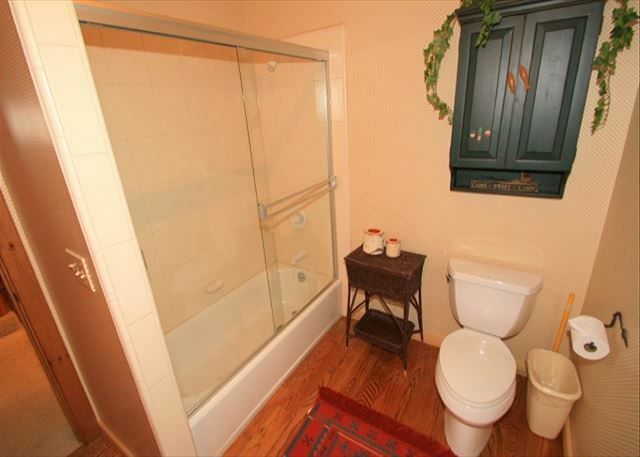 This bathroom has the toilet and shower/Tub in one room for privacy, and the vanity in the bedroom. The second bedroom has a king size bed. In the loft there is a queen size hid-a-bed. 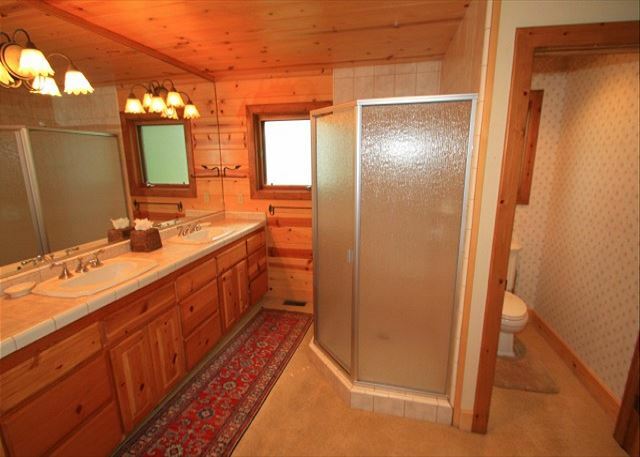 This house is a summer vacation rental, sometimes winter vacation rental and/or winter ski lease. 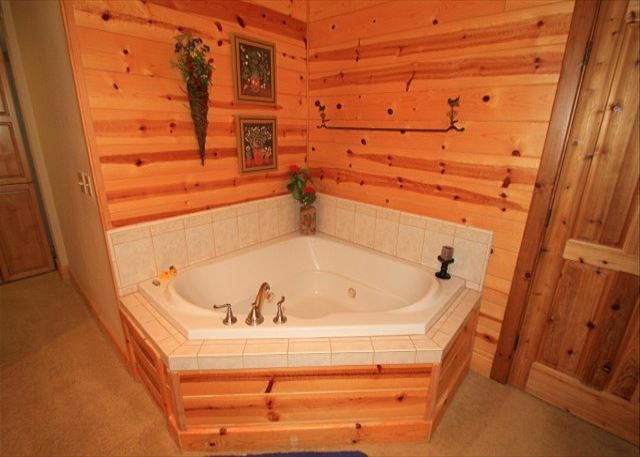 This house has a 7 night minimum with a Sunday to Sunday check in/out. Our units do not have sheets, pillow cases, or towels included in the rental, guests are requested to bring their own. However, we do offer linen rental service with 72 hrs notice before arrival: sheets, pillow cases, and towels at a onetime fee of $10 per person. Check in time is 3pm and check out time is 10am. The Christensen unit#078 offers a 20% discount off the rent for Active Military members, please call for additional information. **Nightly Minimum Subject to Change for Holidays** 4 night minimum for Thanksgiving, 7 night minimum for Christmas/New Year's, 3 night minimum for Martin Luther Holiday Weekend, 3 night minimum for Presidents Holiday Weekend, 3 night minimum over the 4th of July, 3 night minimum for Labor Day holiday Weekend.